The last few days I have seen alot of questions about sharpening broadhead with the Lansky sharpener, so I put this together tonight. I will go thru the 2 blades first and just do an adder for the 4 blades. Things you need Lansky Sharpener (this is the standard knive set), Broadheads (here we have a new Zwickey 2 Blade and a perviously sharpened 4 Blade), paper towels to clead the oil (and possible blood), and a sharpie marker. First mount the head in the clamp with the tapered ferule touching the clamp (4 blades need to be mounted differently). 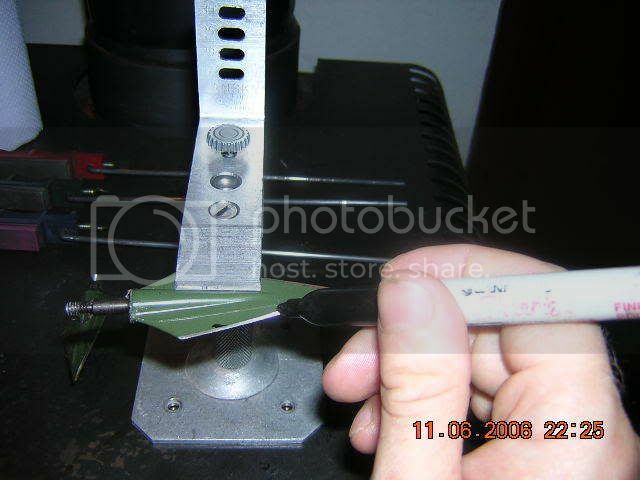 Use a dime to tighten the machine screw until finger tight, then tighten the thumb screw. Next I mark the edge with a sharpie to determine when the angle is set. Now starting with the course or extra course stone you begin the sharpening. Here is the motion that I use during the whole procedure. 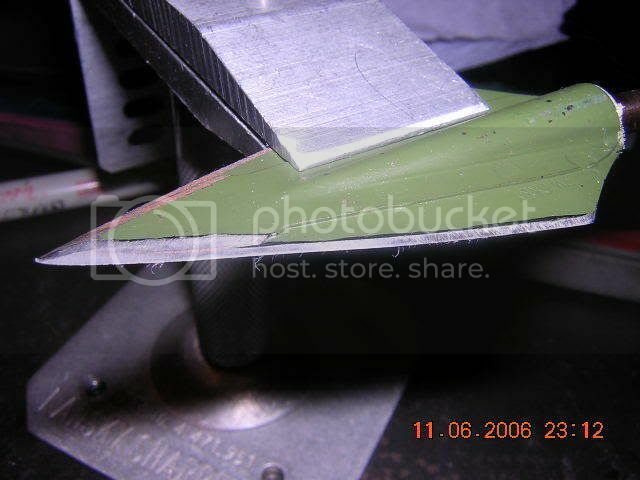 I am using the 25 degree slot, I think this make a very sharp edge that is durable. The 30 degree slot is what I use for my knives, this will get them shaving sharp also, but like like the next level of sharpness on my broadheads. I work the stone with the above motion about 10 passes (1 blade lenght) on one side, then flip the clamp and do 10 passes on the other side. I keep doing this until the blade marking is gone. I also apply a little more pressure to the stone were the marking is. With the Zwickey heads, normally you need to work the point area (triple lam) more then the rest of the blade. Some time I will knock this area down with a file first. Here you can see the edges is not set yet. I will work the course stone more. When I have the angle set and the edge looks like this. I then remark the edge and move to the medium stone. The marking is just to double check that the angle is set. 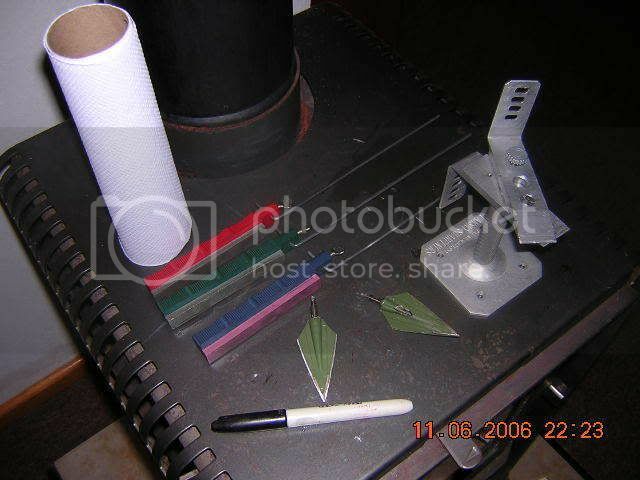 I use the medium stone very little when sharpening a new broadhead. But when I touch them up after shooting I skip the course stone and use the medium first. I do what I call the count down. I make 10 passes, flip the clamp then 10 passes on the other side. Flip the clamp again and do 8 passes, flip and repeat, then 6 per side, 4 per side, and finally 2 per side. I use very little pressure, but even pressure all the way thru the above process. You can hear and feel when you are cutting the edges versus forming the edge. Next I move to the fine stone. Here I do the same as the medium stone, but with lighter pressure. Also I go 10, 9, 8, 7, 6, 5, 4, 3, and 2 per side. At this point the blade will be sharp (shave with little to no pressure), but I like to go one step farther and get them hair popping sharp. This is what you do. make one pass per side by sliding the stone the full lenght of the blade (see below clip). I do this about ten time per side. 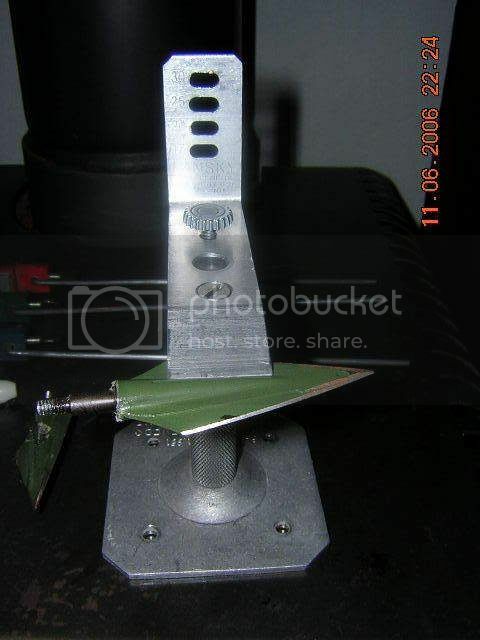 Flip the broadhead to do this same on the other blade. 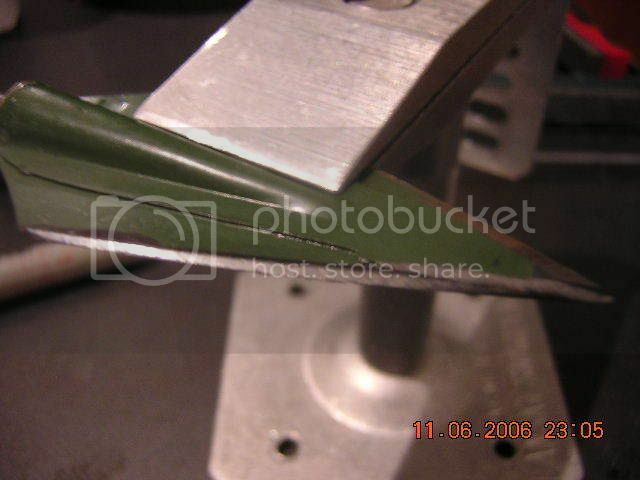 Now have a very sharp broadhead, that will pop hair from your arm. I some time strop the blade three or four time per side on the inside of a leather belt. I am not sure this does anything but polish the blade some more. Next post will be the adder for the four blades. 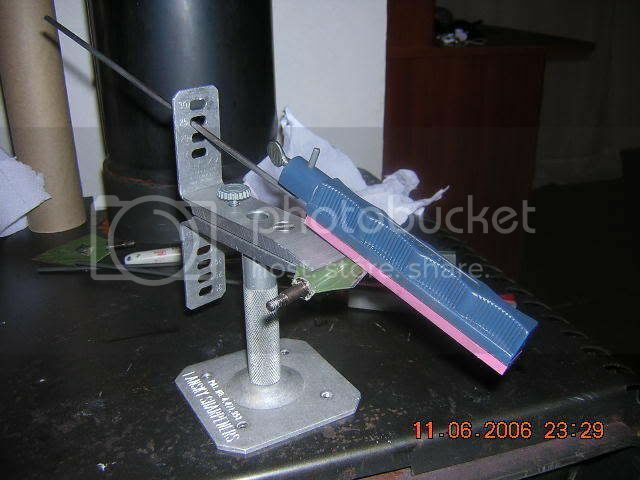 You need to mount the four blades in the clamp a little different from the two blades. This is because the stone has to clear the bleeders. 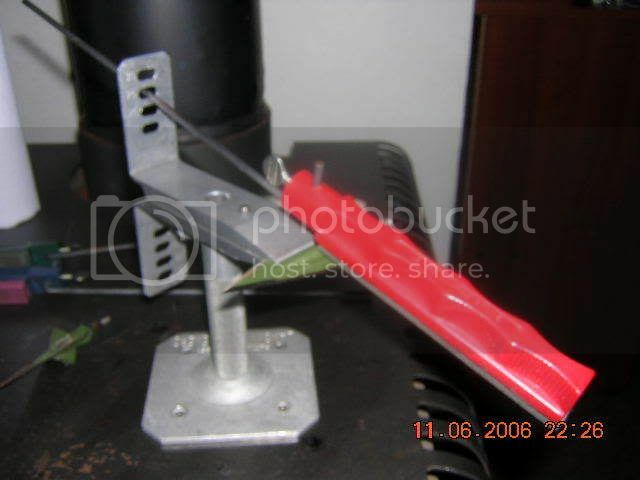 I put the back corner of the blade inline with the clamp corner and the other corner of the clamp against the ferule. 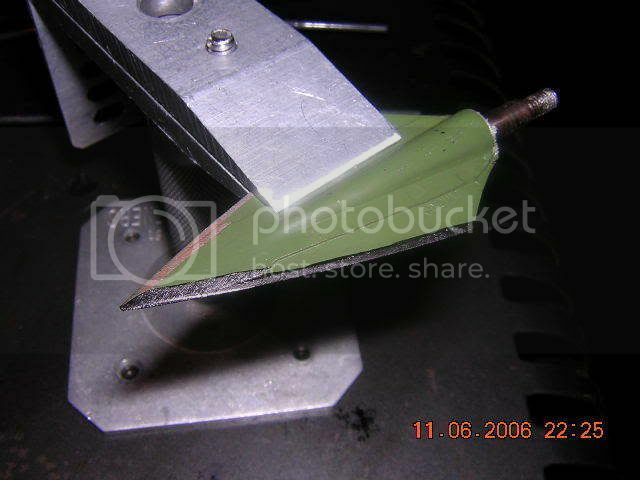 The sharpening motion is also a little different with the bleeder in the way. 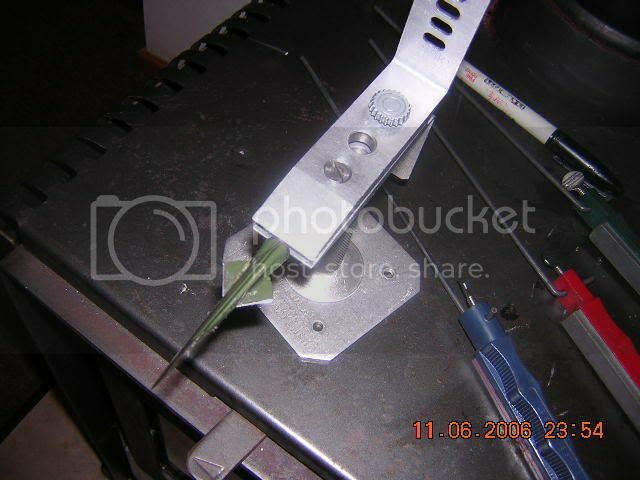 Other then this I do the main blade the same as the 2 blade above. Now on to the bleeders. To mount them in the clamp they must be glue to a broadhead adapter (sorry wood arrow guys). Mount the bleeders straight across. I then use the motion in the next clip with very light pressure. Start with the course stone and make 10 passes per side. Then I use the medium stone and do another count down starting at 6 and working down until 2. Switch to the fine stone and do the same as the medium stone. With the fine stone use very light pressure. That is it. Normally this will take me about 10 minutes per broadhead when they are new. For touching them up I can do them in about 3 minute per broadhead. 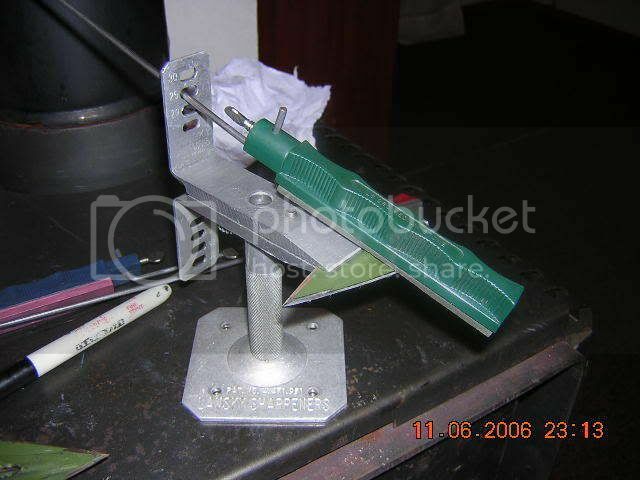 But this is not some thing I rush, as I enjoy sharpening. I hope this helps some of you guys that have been have trouble with your lansky sharpeners. If you have any question just post away. Nice tute man. Thanks for takin the time to post it. Goodbye Shiner you were always a good dog. Bamboo I could e-mail them to you if you would like? Can the people with windows see the clips? I can see them but, it also my photobucket and automaticly logs me in. Vary nice work. Have never sharpened the 4 balders on my lansky before, thanks for the help. Excellent Tutorial. Could this go in the 'How To' secton for future reference, please mods? "I came into this world, kicking, screaming & covered in someone else's blood. I have no problem going out the same way"
Looks like everyone can see the clips. That was my first time post video. 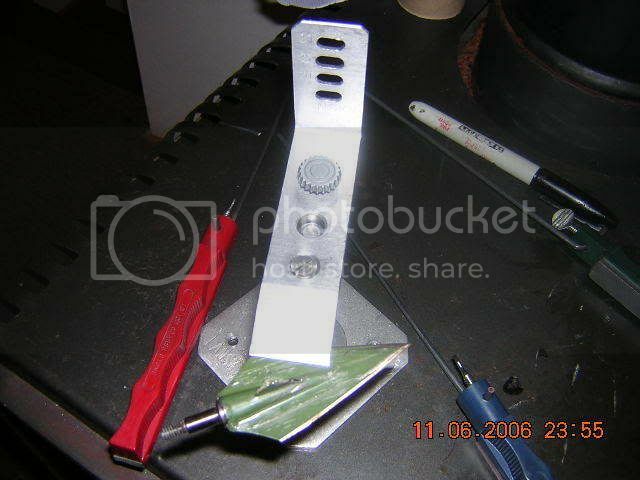 I bought this Lansky about 15 years ago and it is the only tool I use for sharpening since then. Before I have this I could not sharpen anything. I use this on everything from my kitchen, hunt, and pocket knives. thanks! that's great....works very well.